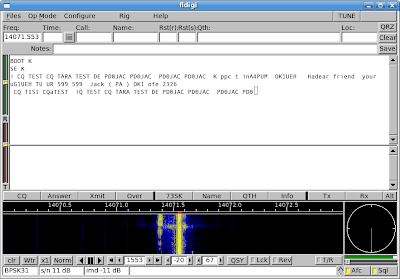 When working PSK31 or other "digimodes" on HF (high frequency) radio, we commonly use computer soundcards to analyze and transmit data. 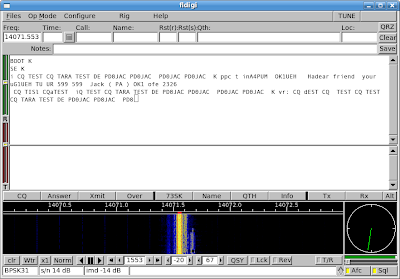 I like to use the Linux program fldigi for this, along with my Ten-Tec Orion transceiver. The soundcard takes in the entire audio output from the Orion, typically 100 - 3,000 Hz. Fldigi (and similar software) allows you to point to a transmission of interest on a "waterfall" spectral display. This automatically sets the decoder to analyze data in a small band around the cursor using digital filtering. This works well when the bands are relatively quiet, but when you have a band crowded with strong signals, the signal of interest can be strongly affected by "out of band" signals (but still in the 3 kHz audio region) that key the receiver's AGC (automatic gain control). In this case, we need narrower IF (intermediate frequency) filtering than 3 kHz. Fortunately, a DSP (digital signal processing) rig like the Orion provides "infinitely" adjustable IF bandpass characteristics, so it is possible to "zoom in" on the signal of interest, largely rejecting any signals outside the small IF passband. Here are a few screenshots to show what is going on. Ultimately, it would be great to integrate the oFilter functions into fldigi or a similar program, using convenient mouse controls. 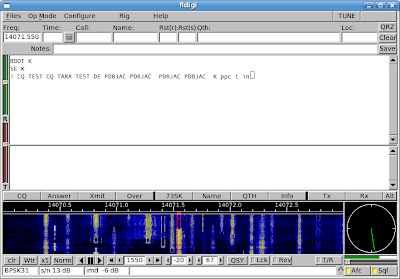 coming in the 3 kHz default bandpass. more-or-less centered on the signal of interest. Zooming in to a 100 Hz bandpass (minimum available).